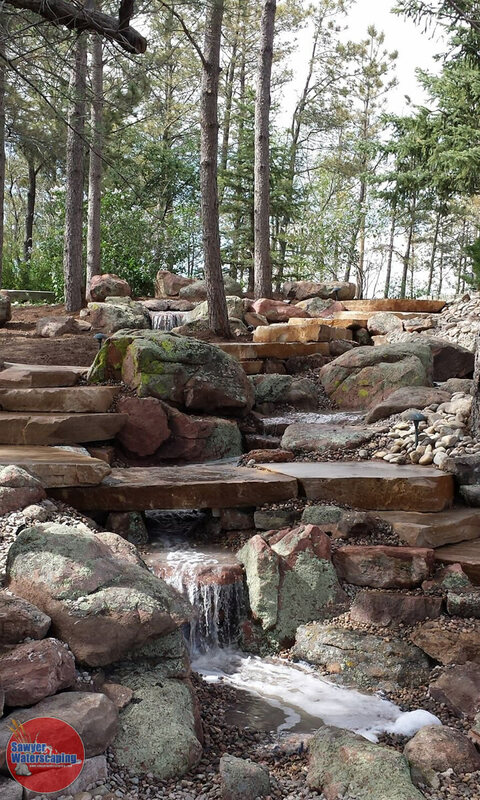 The Joannides Pond-less Waterfall was built in the Spring of 2014. 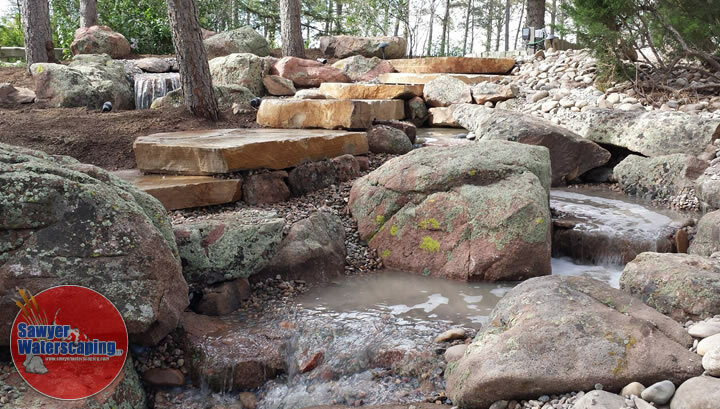 It consists of over a 50′ stream that twists and turns through large moss boulders as it drops more the 15 vertical feet. 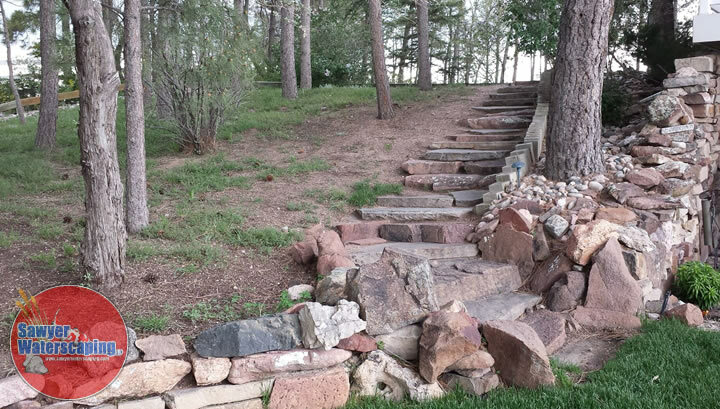 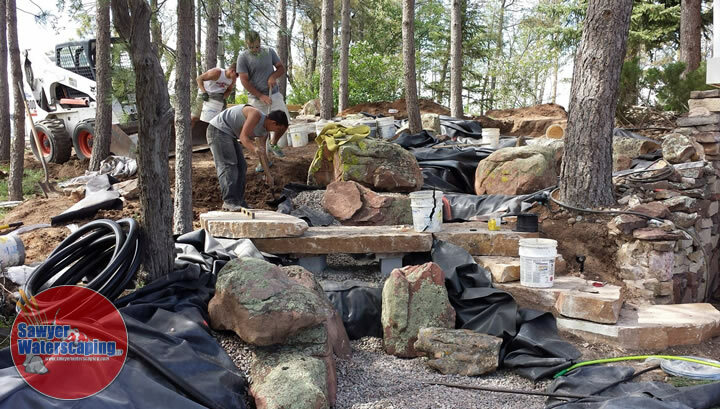 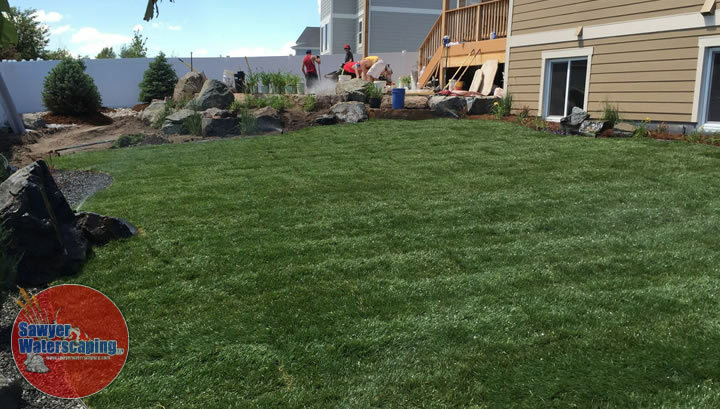 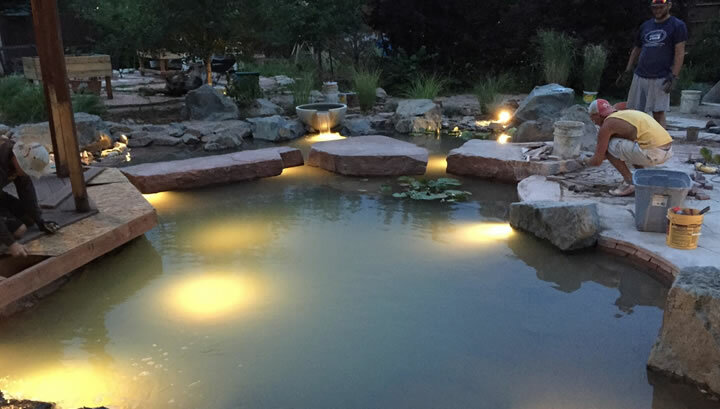 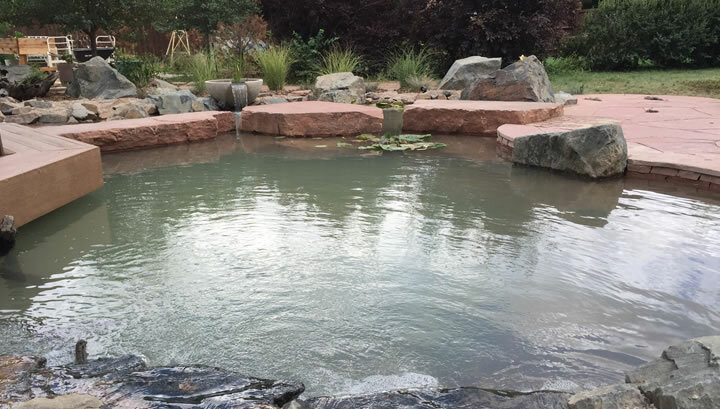 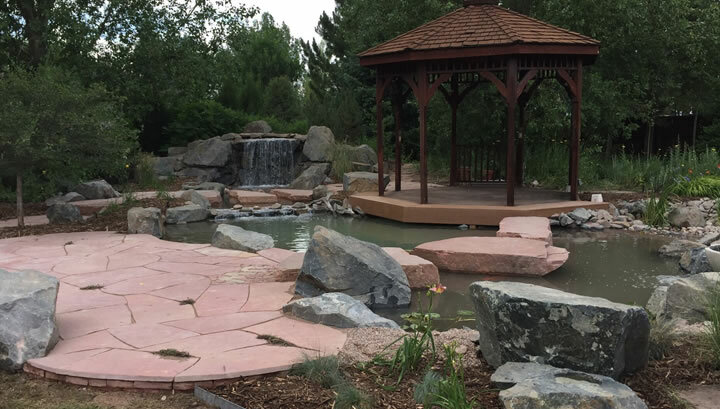 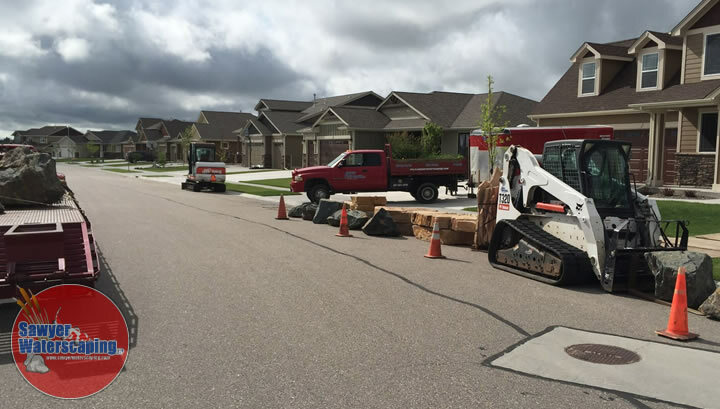 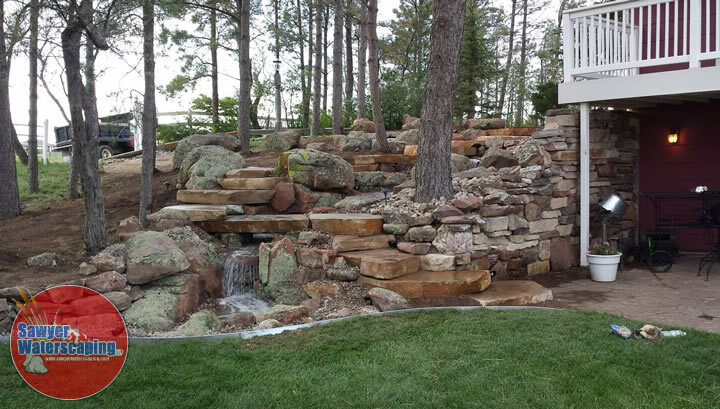 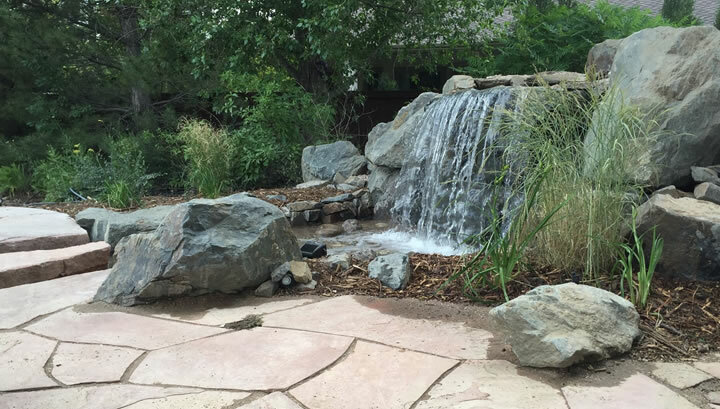 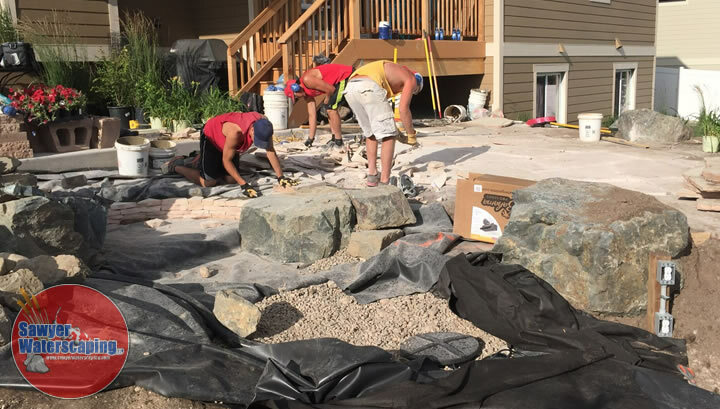 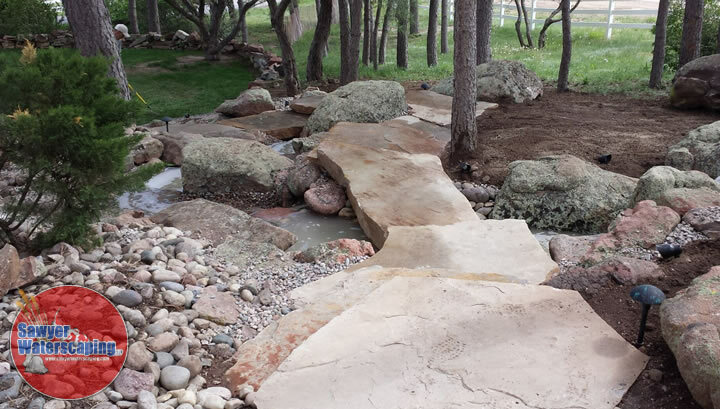 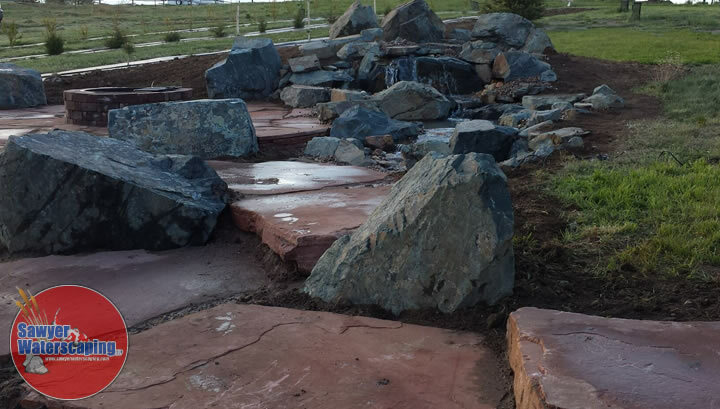 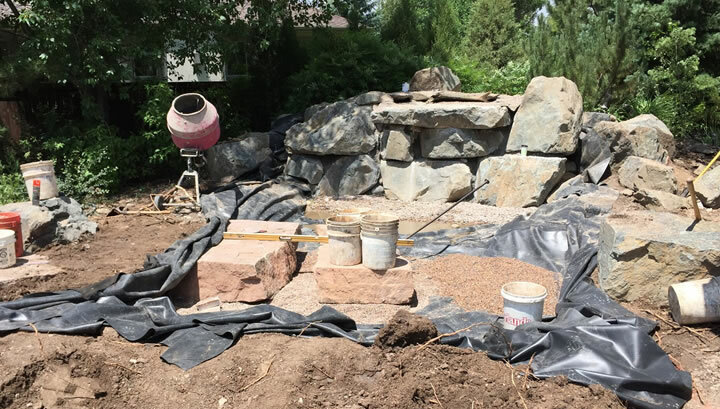 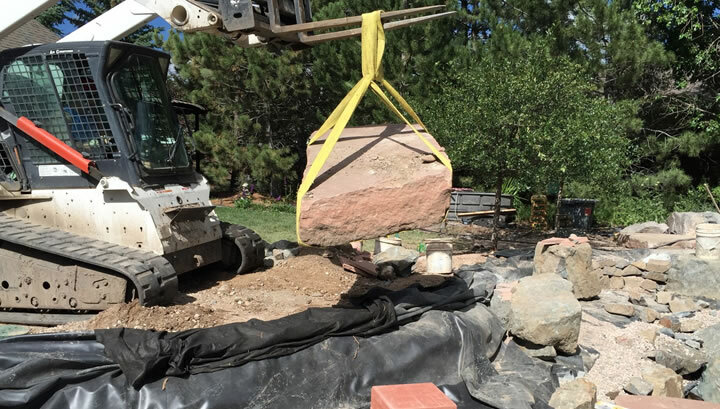 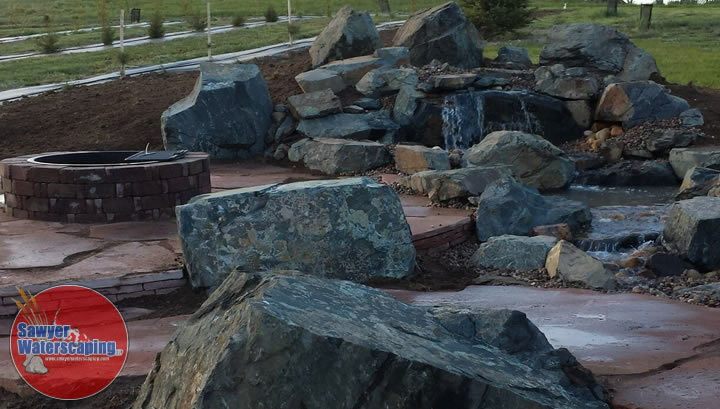 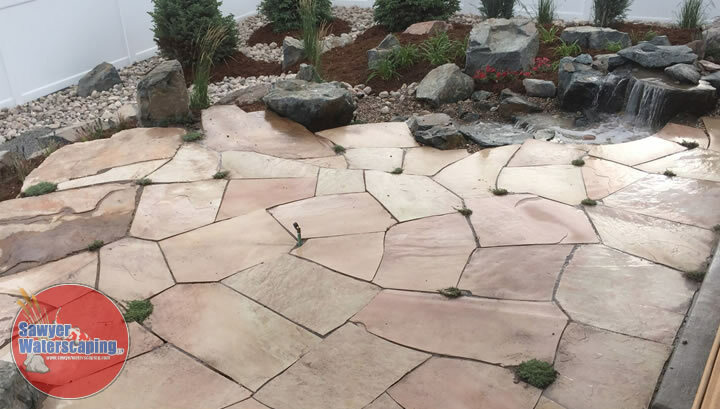 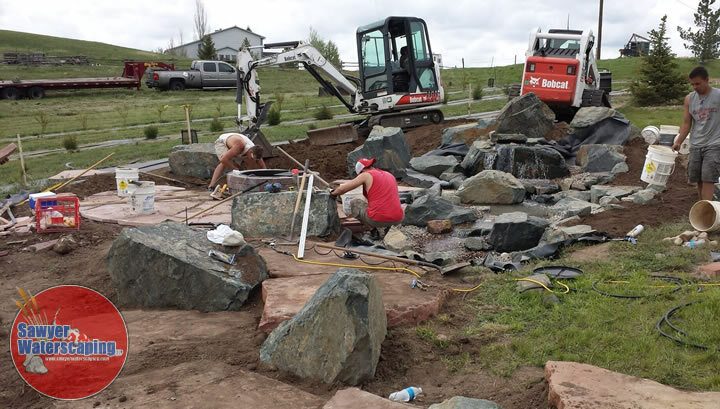 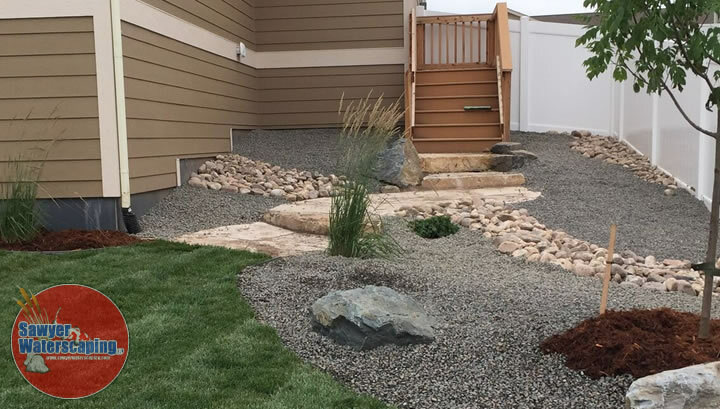 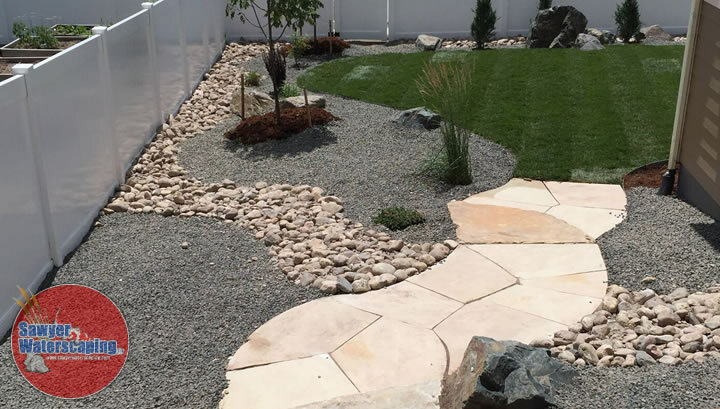 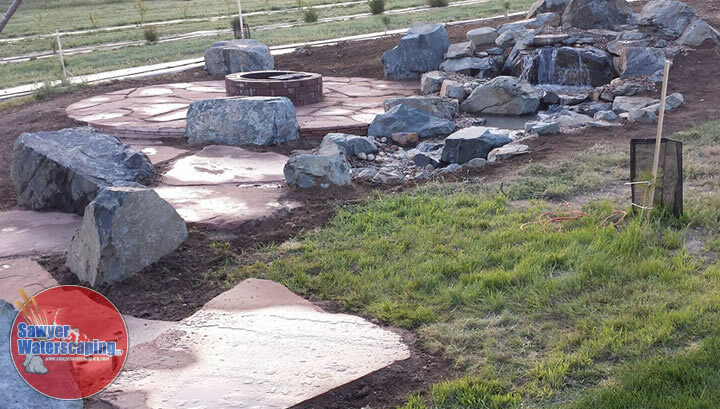 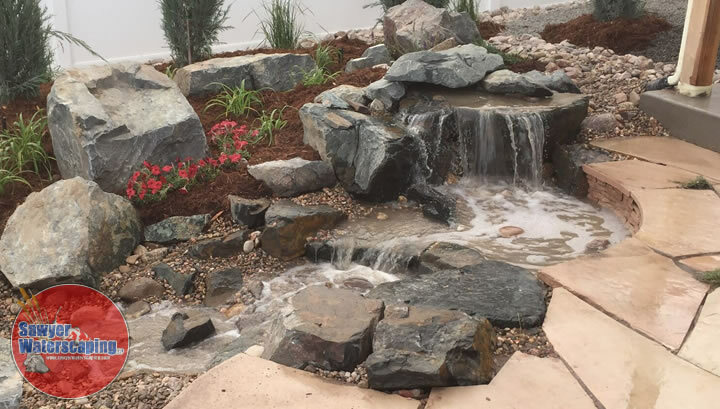 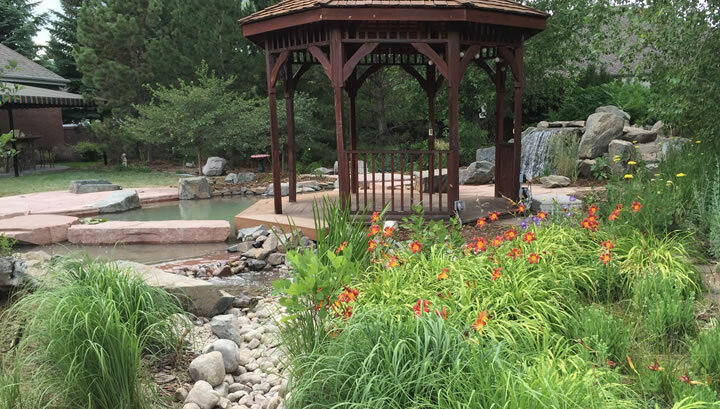 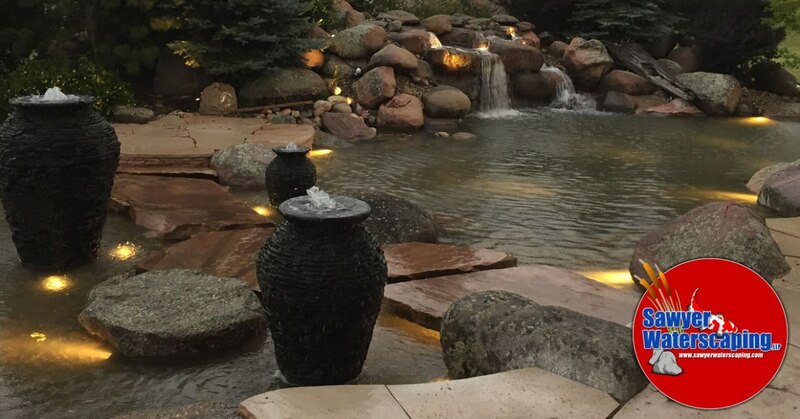 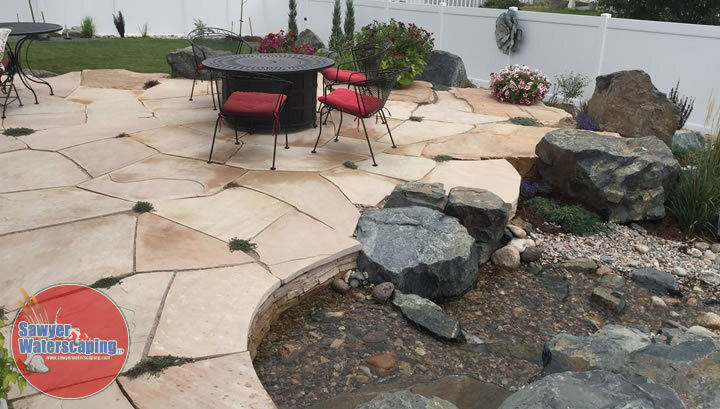 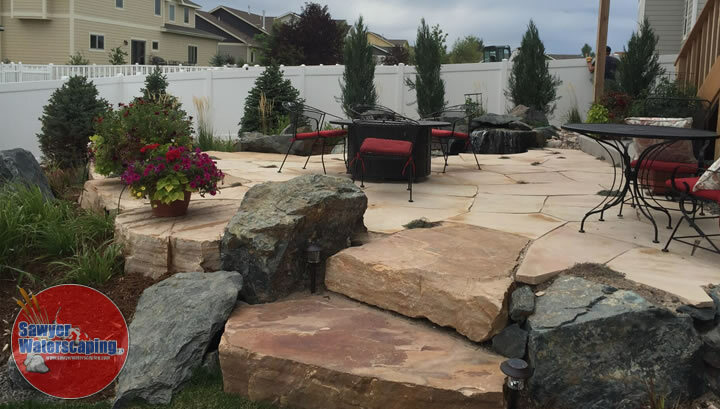 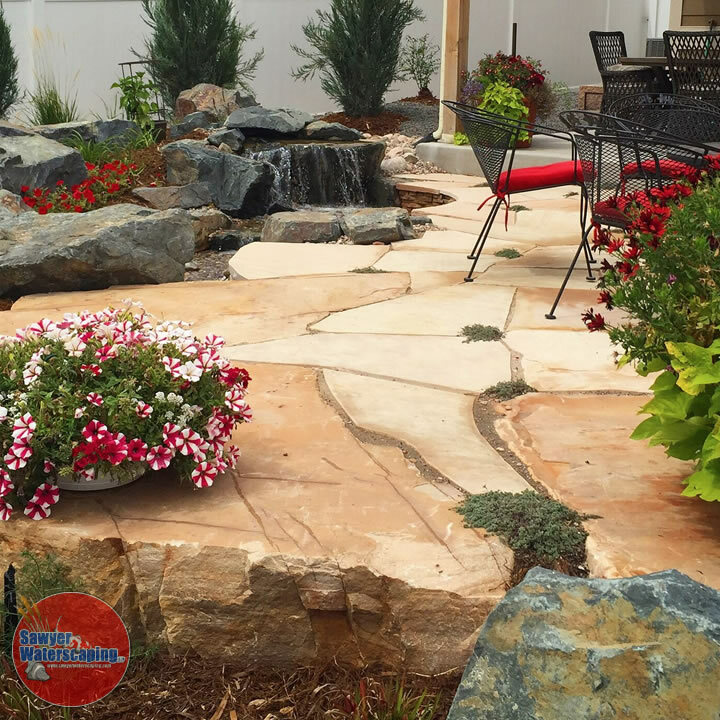 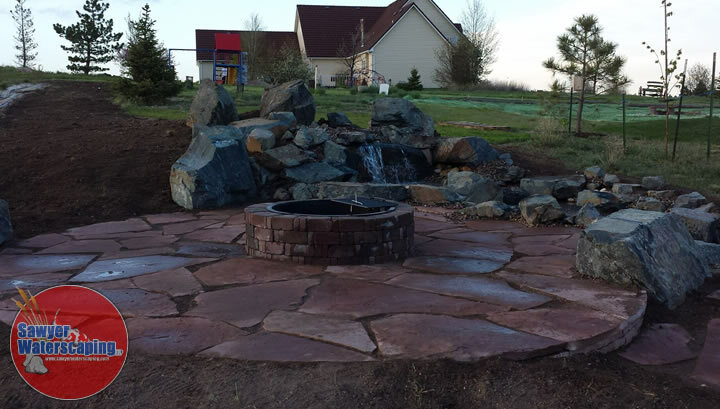 The use of over 30 tons of boulders and buff flagstone treads, allows this natural water feature to blend right into the hillside of lodgepole pines. 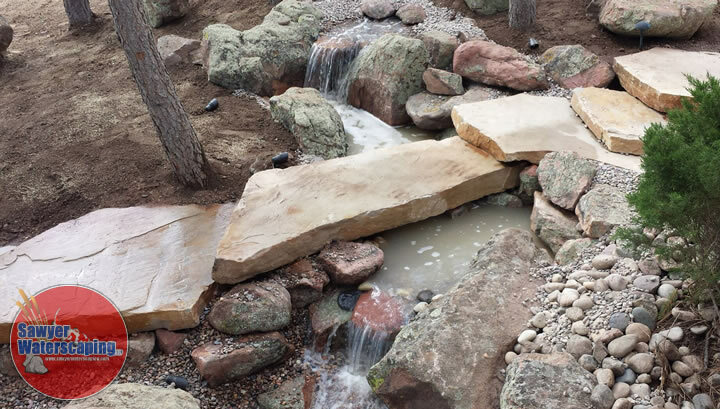 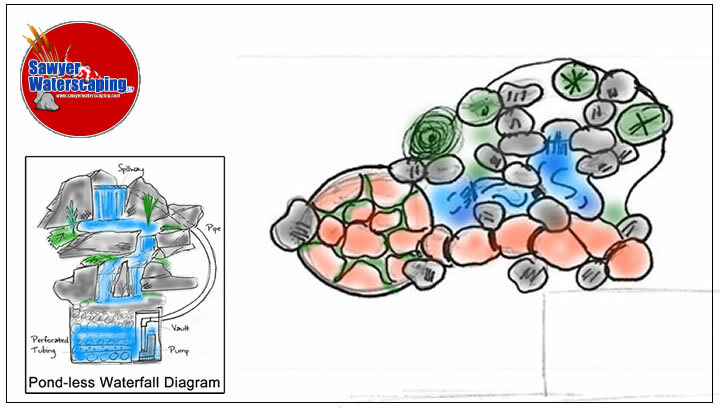 The large steppers wind and cross the stream in two places allowing for very close access to the feature. 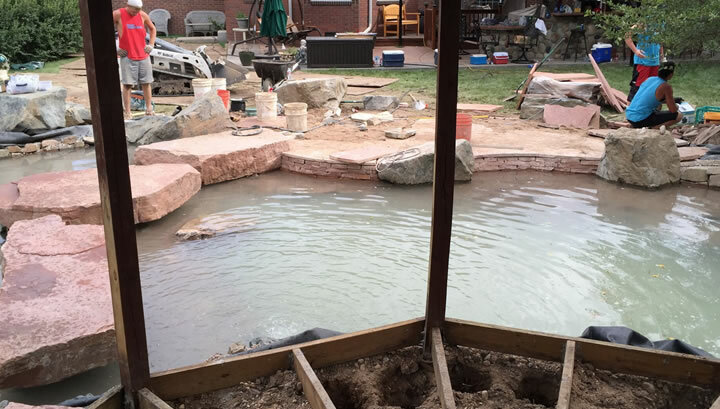 We built the original pond back in 2002. 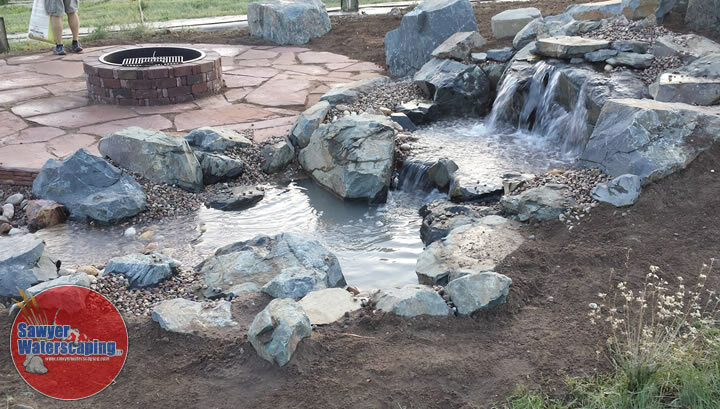 After twelve years of loving their pond, it was time for an upgrade. 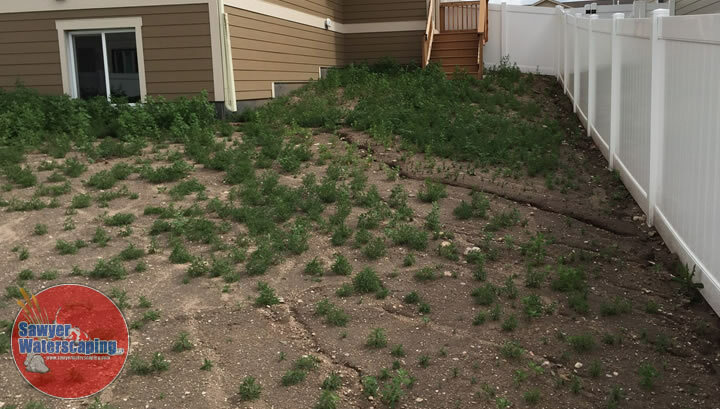 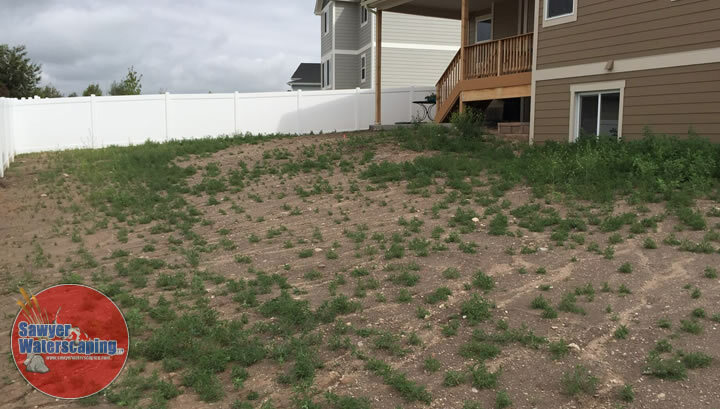 Overgrown plants and upkeep were becoming more of a problem every summer. So, an improved filtration system was on top of the list. 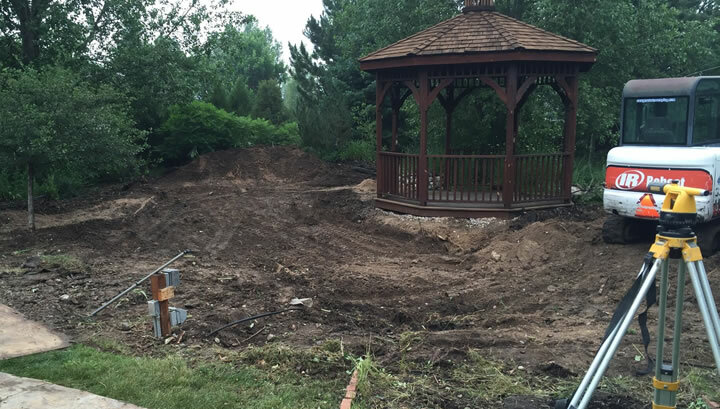 Not to mention, we were going to make it bigger and better! 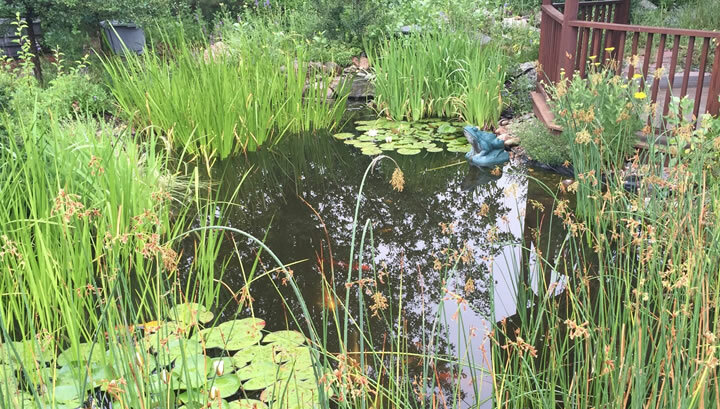 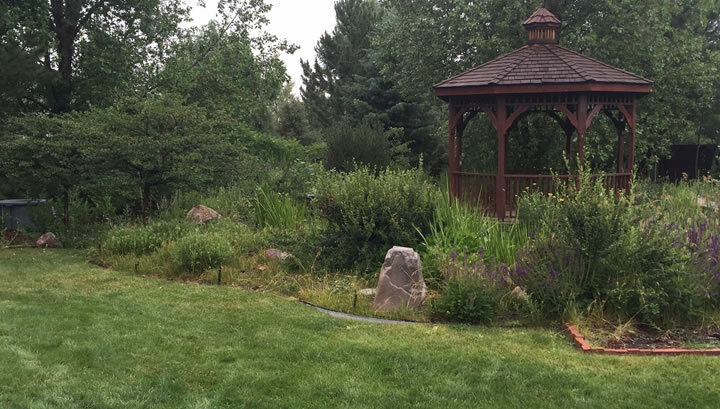 Overgrown with irises and cattails, the original pond was hard to see anymore! 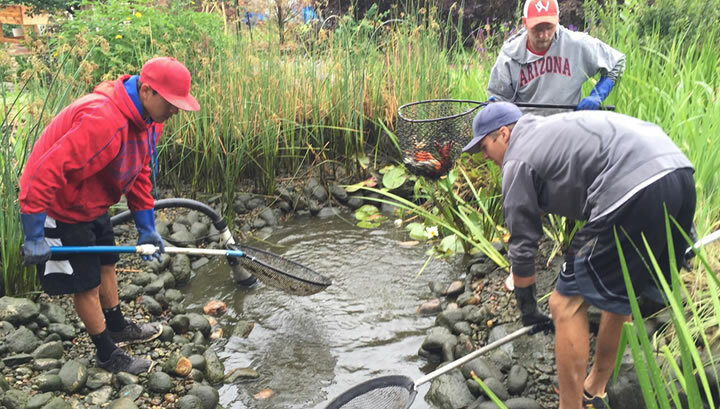 Catching the Koi to place them in their temporary home! 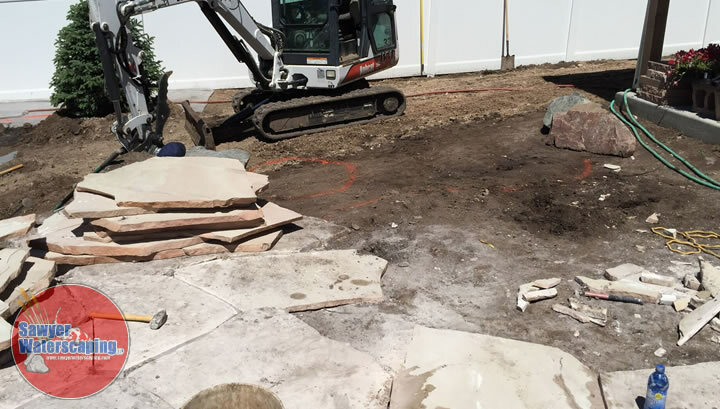 Lots of nasty organic material to remove. 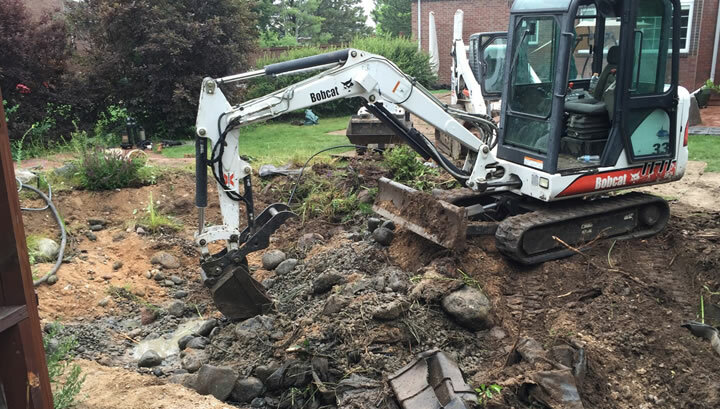 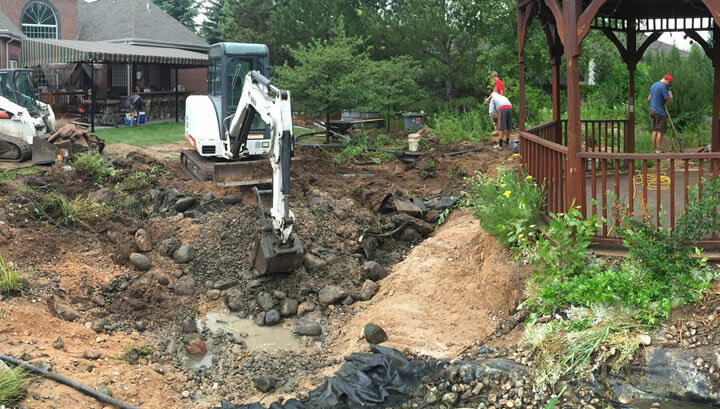 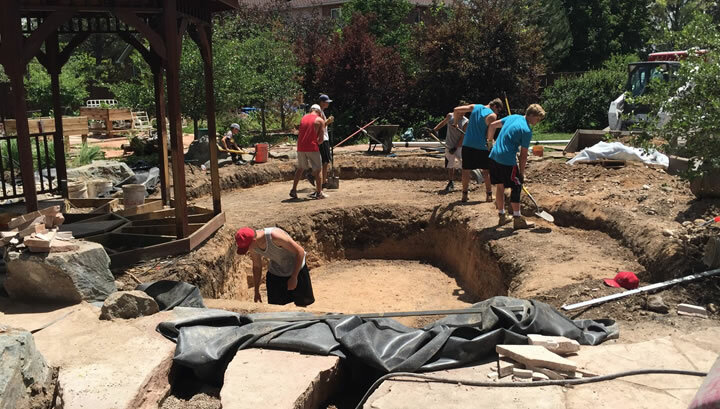 Above: Removing all of the rock and sludge from the old pond. 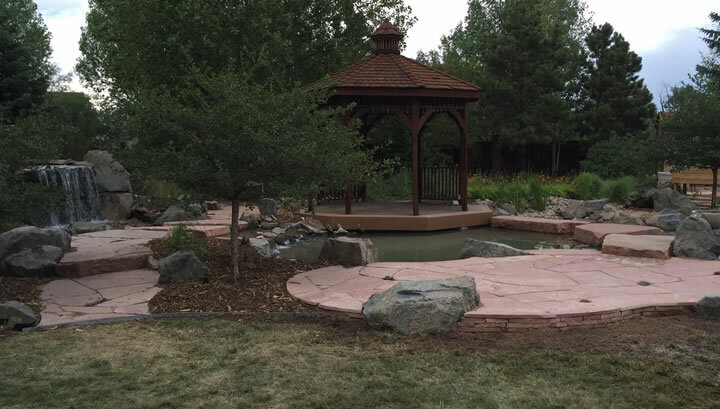 The gazebo, which we also built back in 2002, will only be getting a mild modification that will allow for better viewing of the koi. 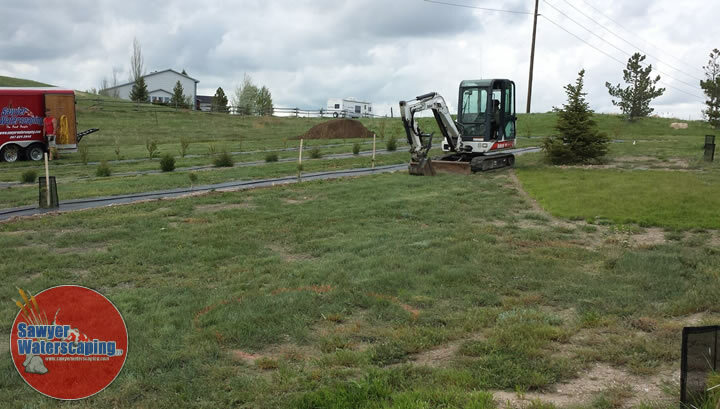 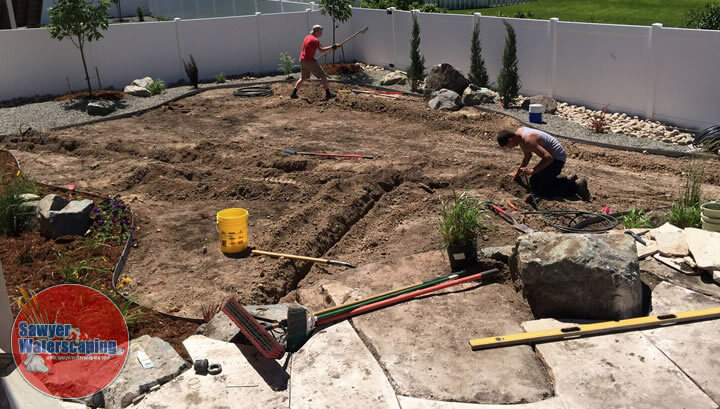 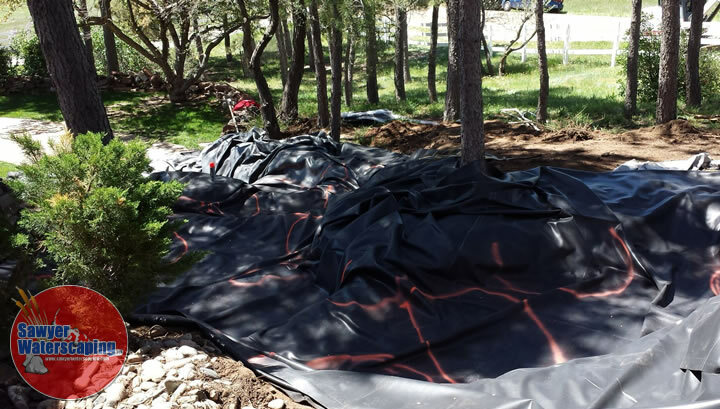 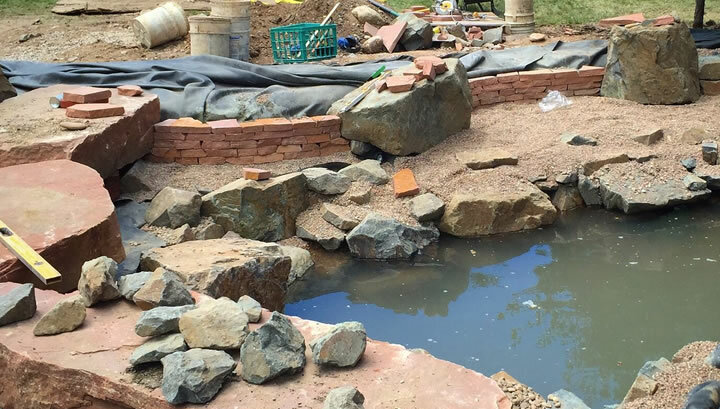 Below: The pond is filled in with new, fresh topsoil. 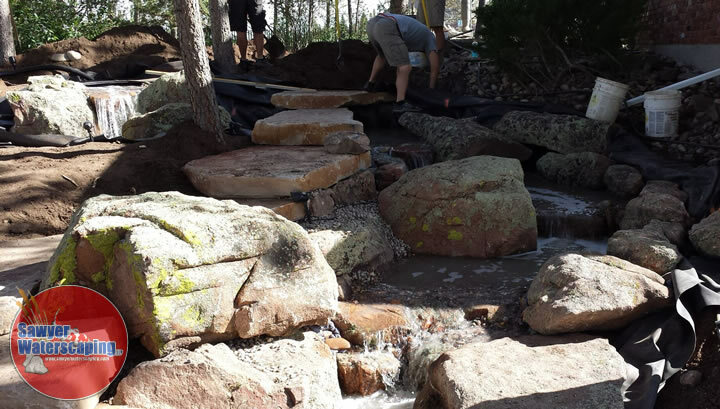 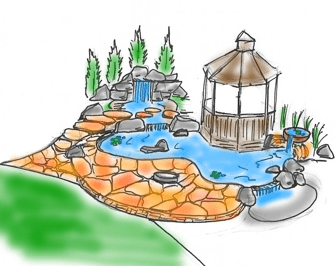 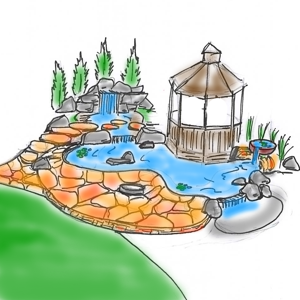 Primarily so we could re-shape the pond, but also for access to construct the new bigger and higher main waterfall. 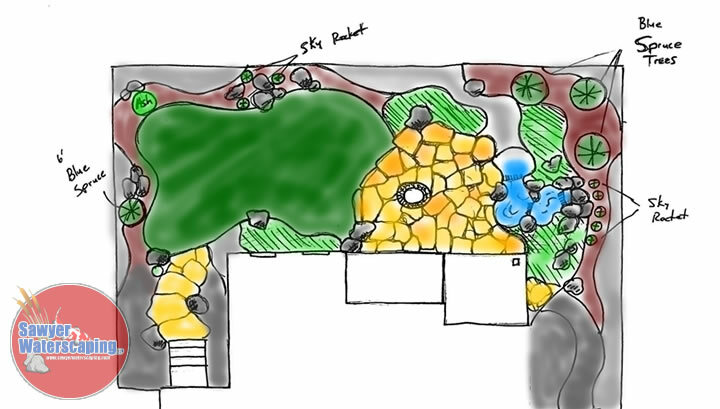 Below: A good height comparison of the main waterfall drop. 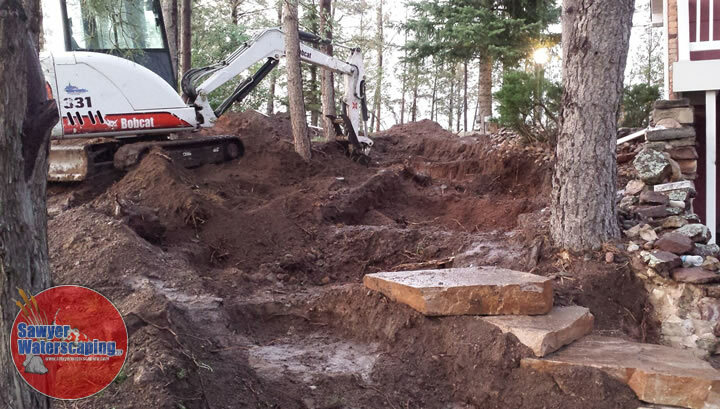 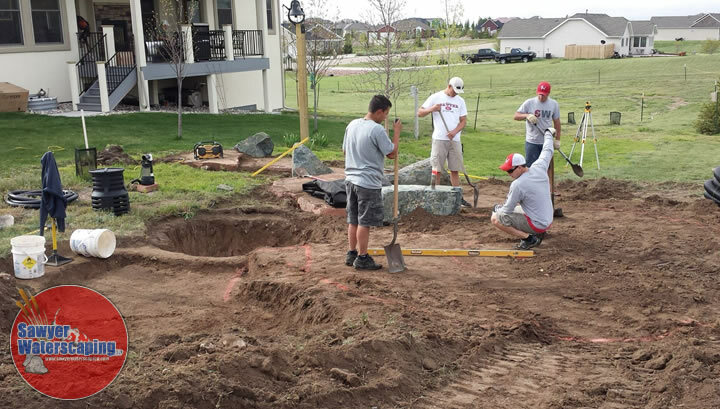 We had to start building the waterfall first, since there would not be any access once the pond was built. 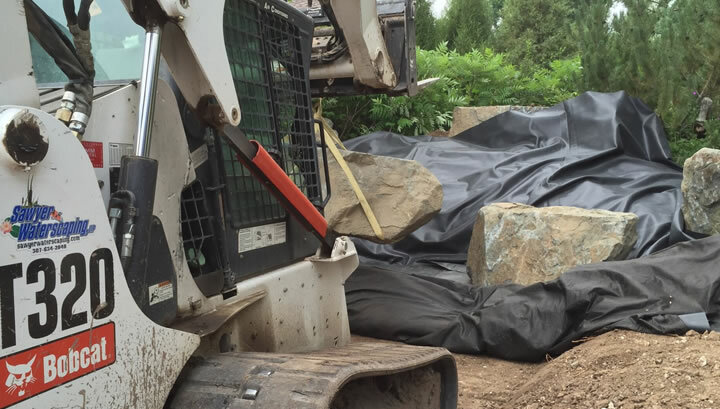 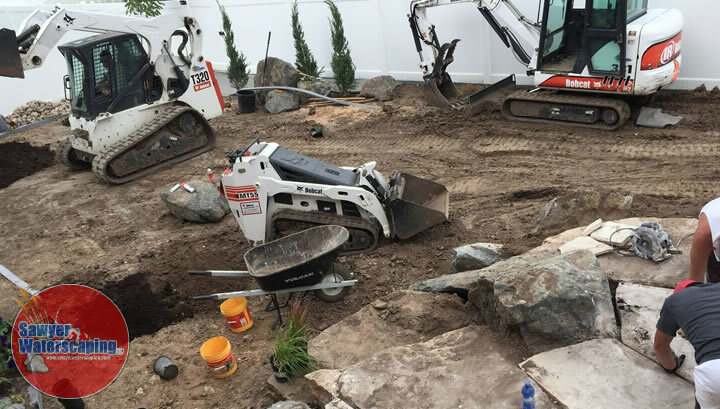 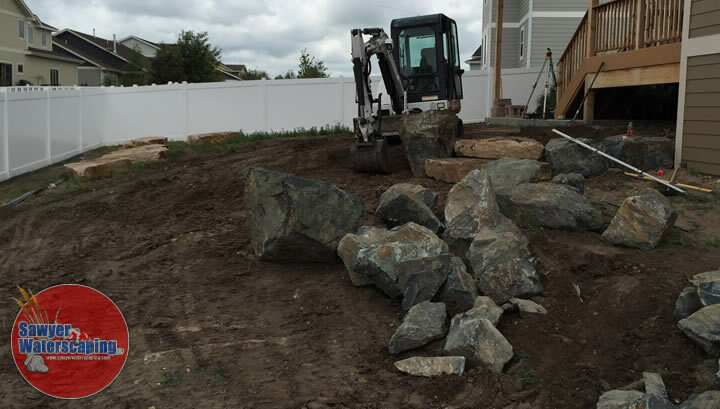 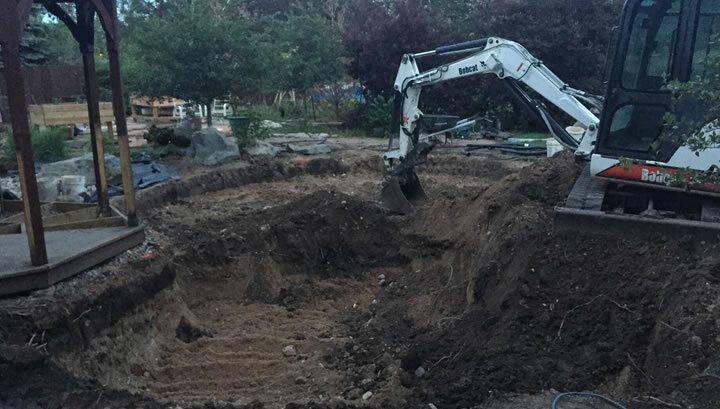 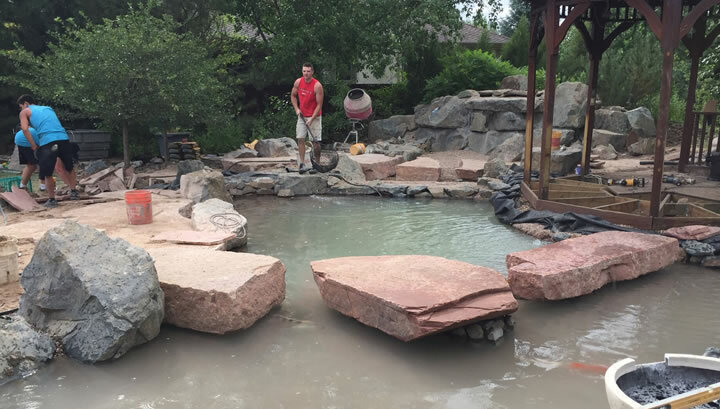 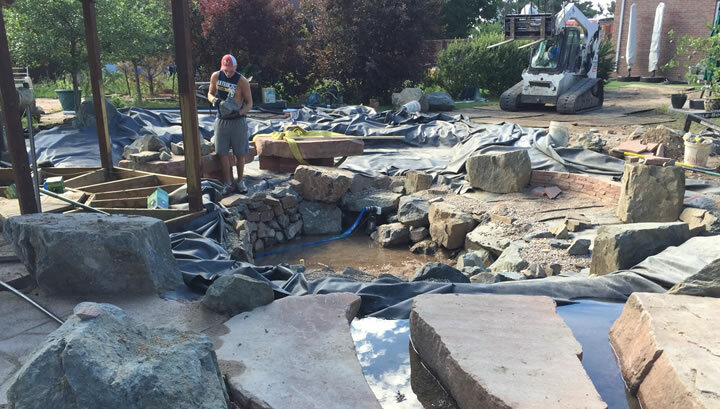 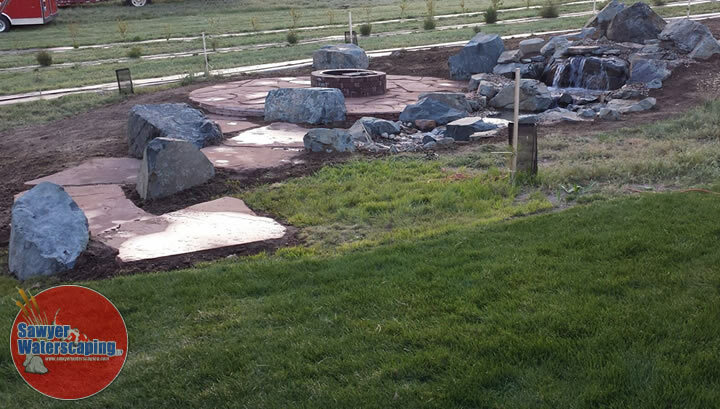 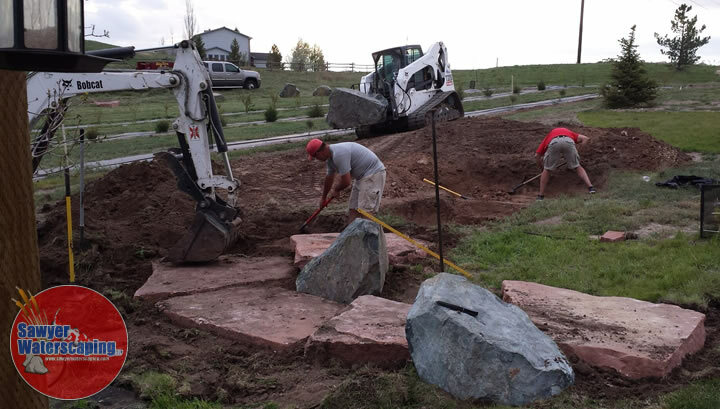 Above: As you can see the waterfall boulders are being concreted in for a solid structure. 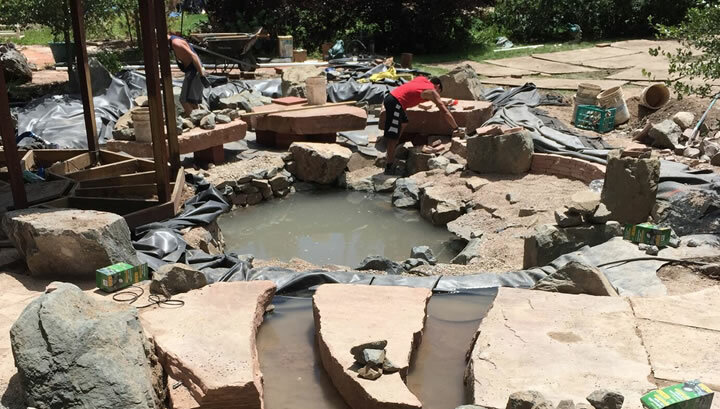 Below: Now that the waterfall walkway is set, time to start excavating the pond. 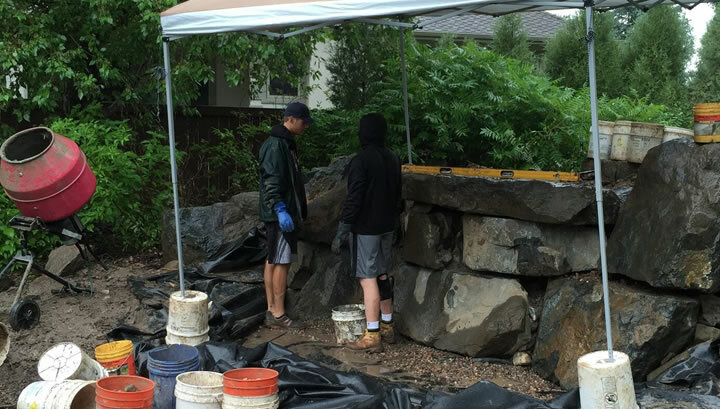 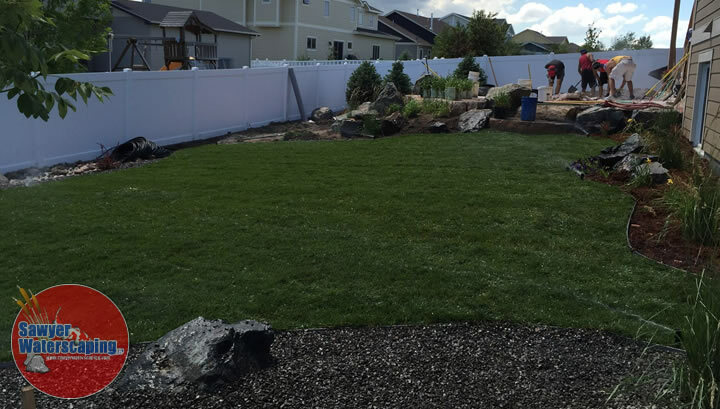 Building the walls of the pond with smaller hand sized granite that is being concreted in. 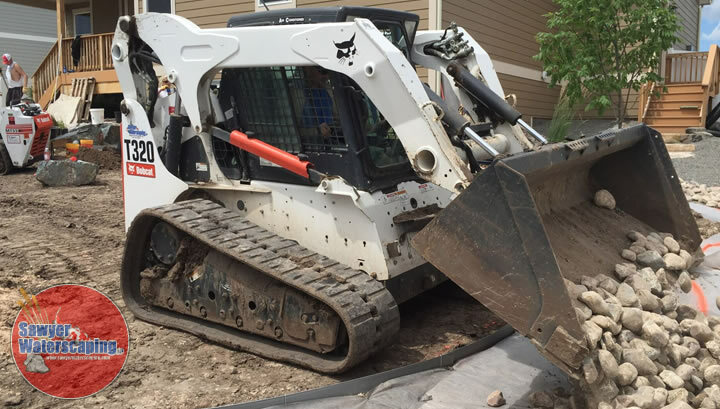 Below: Notice the 2″ PVC piping…this is suction filtration system. 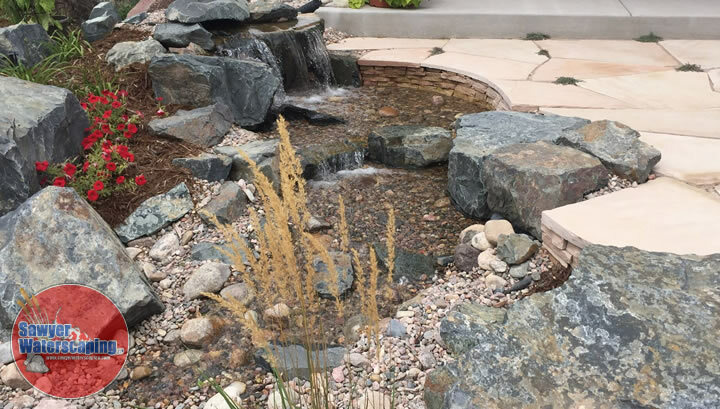 Much like what aquariums have, a non submersible pump will pull water through the bottom gravel and rock keeping the pond much cleaner. 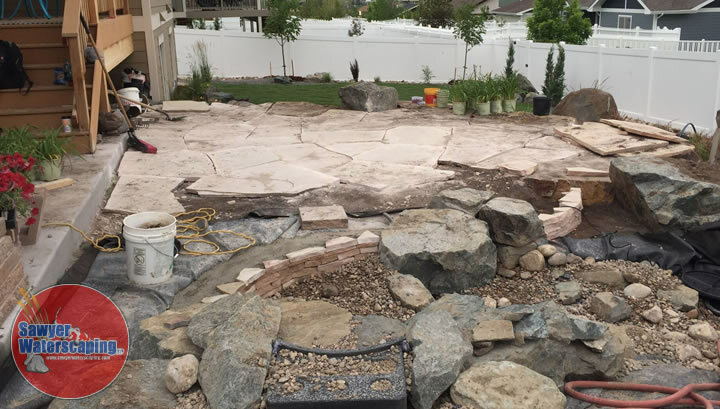 Below: Bottom level done and floating flagstone steppers almost complete. 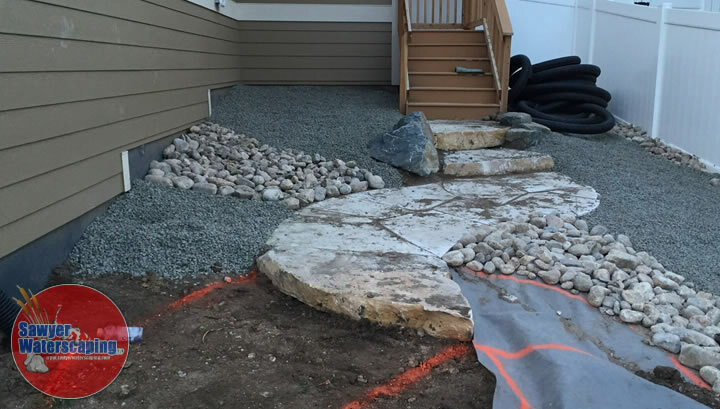 Below: Floating steps are concreted in and set, while we finishing up the stacked flagstone edge. 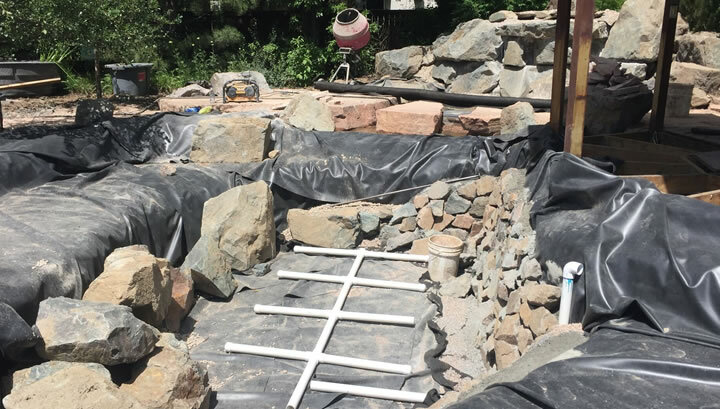 This flagstone wall will be part of the patio. 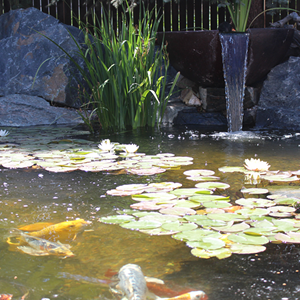 Below: The fish are enjoying their new home. 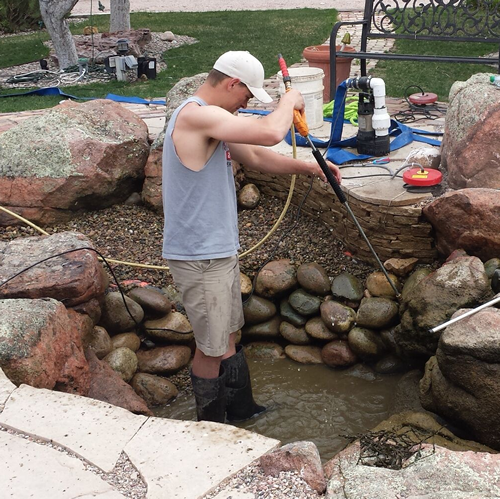 The water is murky, in large part to all of the dirty rock due to all the that we had. 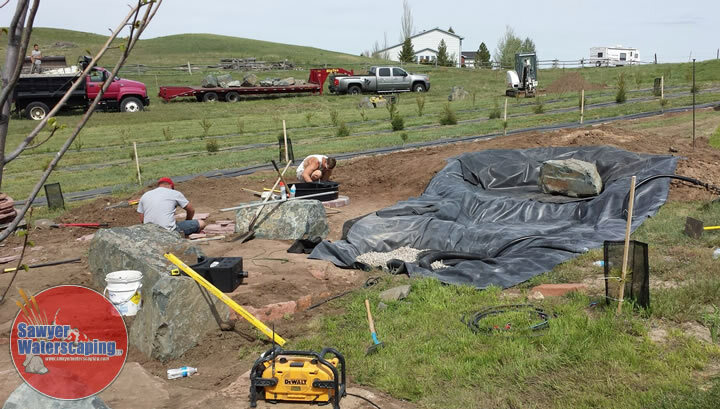 Below: Working on the lights and gazebo. 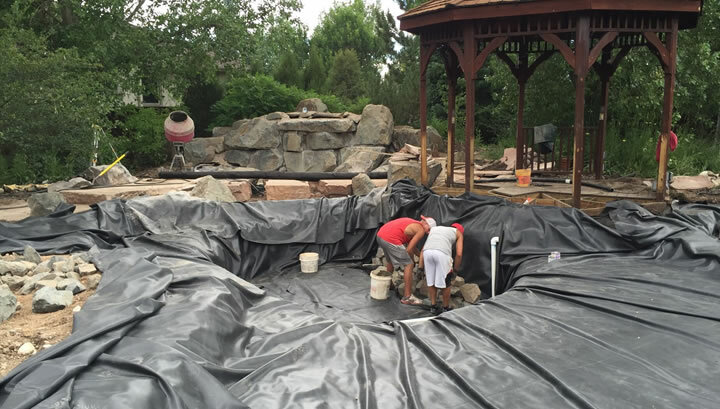 Some final pics…water is still murky, but everything is operating smoothly. 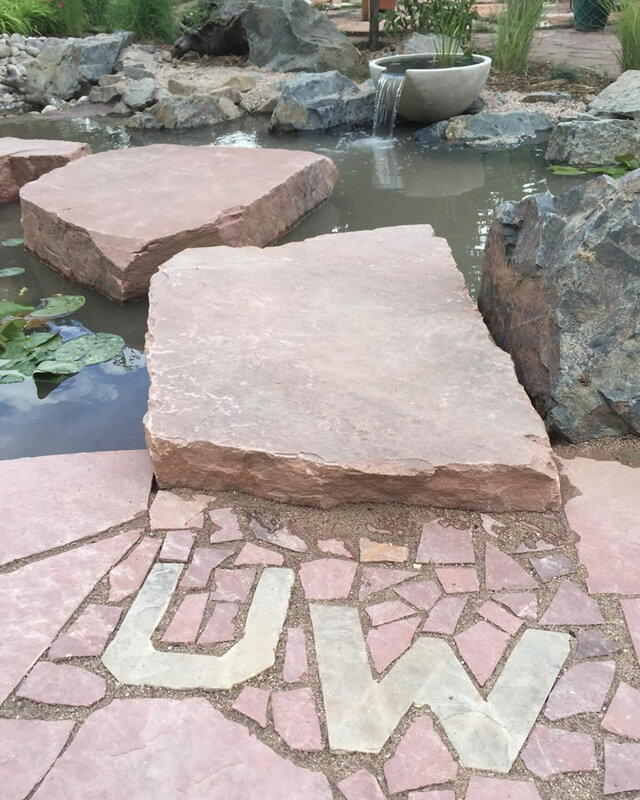 Below: The Long’s are big UW fans…so we added a little personalized touch!